• Building a Pain-coping Mindset – tried and true ways of easing pain (emotional or physical), a different one in each class! We spend more than 1/3 of each class on pain coping practices. • Navigating Labor Land – Not a regurgitation of obstetrical information, rather, assistance in self-discovery where you uncover your own best ways of coping with the unknown of labor and birth. • Three Kinds of Knowing – Primordial knowing: your innate instinct, Modern knowing: being savvy about what’s happening in the hospital, and *most* importantly, Knowing yourself: before you can know where you are going, you need to know from where you came and where you stand now. • Exploring Possibilities – We serve the whole birth pie, not just a sliver of “ideal” birth scenarios. Those are easy to fantasize about and nearly impossible to achieve! • Fathers and Partners – We acknowledge that fathers and partners are opening to the profound power of birth too! We share practical tips for coping – yours AND hers – and what she really needs from you during the birth process. • Working Through Fears – Cage a tiger once and for all! After all, “worry is the work of pregnancy”! • When Medical Support Is Needed – How to give birth from within, even when an epidural or a cesarean birth becomes the next best thing. • Looking Ahead to Postpartum Life – What you *really* need to line up in order to have a smooth postpartum transition, and setting realistic expectations of everyone involved. We focus on doing the next best thing, with attention to great love. The Complete Childbirth Class (either the 6 week series or the weekend immersion) fee is $325/couple and that includes everything you need to participate in these highly dynamic classes, as well as a digital notebook (google doc), rich in resources, thoughtfully compiled, that will support you through the childbearing year. Does my husband/partner come to the class? YES! Emphatically yes! We believe that complete birth preparation includes both parents and we deeply respect the individual journey of mothers and fathers. Our unique curriculum will speak to BOTH of you, individually AND as a couple. Because we believe so strongly in the unique tasks of preparation for mothers and fathers/birth companions, we have a special class just for them, embedded in the full 6 week series. Babies come to all kinds of families. 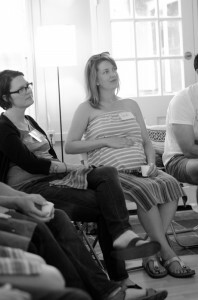 You don’t have to have a partner to have a child or come to our childbirth class. We do highly recommend that you bring with you to class whoever will be with you during your birth. This could be a friend, your doula, a family member, etc. Anyone you will be relying on for support is welcome to come with you. We are not meant to go through this initiation alone! When should I start the class? We recommend you begin your childbirth class between 28-30 weeks if possible. 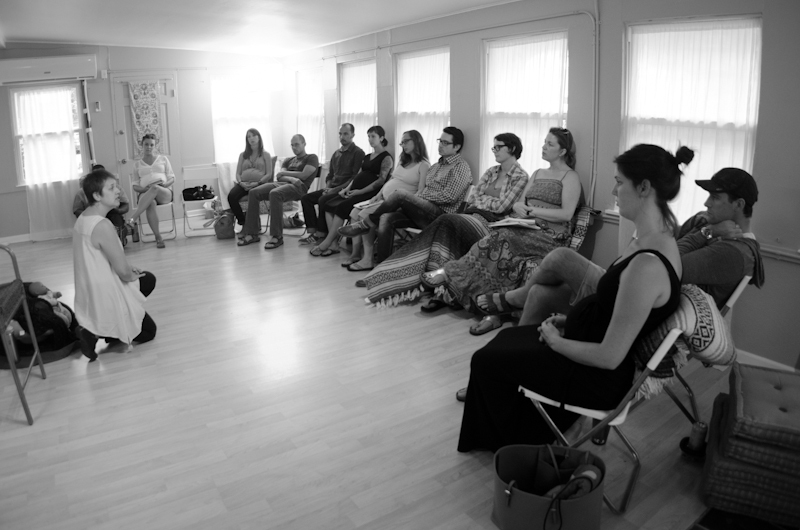 The Complete Childbirth Class is focused on childbirth and postpartum and before 28 weeks, even though you might be thinking about the birth, it’s still far enough away that the tools from the class can become lost in the getting-ready-for-baby tasks. We want you to step in fully to your pregnancy and cherish this unfolding experience without rushing to the end. Also, experience has taught us that by about 36 weeks, mothers turn inward. Sometimes profoundly. Their focus shifts even deeper as their baby draws great energy from them. They turn a psychic corner where they move slower, think slower, and are saturated with birth information. We believe the last month of pregnancy is magical and we highly encourage mothers to tune out the world rushing around them and turn inward to the great wisdom within. We love getting inquiries from potential class participants! Please contact us to ask whatever questions arise for you! I wanted to thank you for such a wonderful class. So much of what you imparted has come true in the past 6 weeks- almost everyday I have a Lanell moment where I recognize something you said – now playing out before me. Somehow even all these new experiences feel familiar because you prepared me for them. It’s like the sign of a great haircut that still looks good months after you got it- your class is still strong in my mind. I’ve had some time now to process everything from your birthing classes, and I wanted to express my deepest thanks! Now I can see why my doula and midwife feel that your class is the best out there. Of course I have nothing to compare it to, but I have a good hunch that yours was top notch. Every night after your class my husband and I had a new reason why your class felt relevant to us. I particularly appreciated your references to animals and nature. We both appreciated that the class had just enough hippy-dippy stuff to make us think, with plenty of practical information to grab onto. We also enjoyed your presentation style. You were calm and easy to trust. I think you are skilled at making the class relevant for both a woman birthing at home or at the hospital. We’ve heard that some hospital birthing classes utilize graphic videos and stories as teaching tools. We learned from your class that such videos and stories are unnecessary when the person teaching the class has enough real life insight to share. In the end we walked away truly appreciating the wonder, amazement, and diversity of birth. So thank you for helping us understand the bigger picture. I feel that your class has given me the mindset I will need to endure my homebirth. Even though it’s going to hurt like hell, I’m actually looking forward to my big, labyrinthine adventure! I love working with Lanell’s BFW students. I think her class encourages parents to be less outcome-based and more focused on the experience. I also love the birth tiger exercise, the way it enables people to dig deeply into their perceptions about birth ahead of time. The idea of embracing birth as part of the life journey is so rich and important. When I’m on my way to a birth with a client that has attended these classes, I get very excited, I know that it will be a birth without fear, and a birth without fear is a calm and joyous birth.